New Zealand has been enjoying a long period of uninterrupted sunlight, and this looks likely to continue until at least 2014. Despite some parts of the country experiencing rain or heavy cloud cover, the light of the Sun continues to reach almost every part of New Zealand. The abundance of light can be attributed to prudent and sensible economic management by government, and the implementation of sound fiscal and monetary policies. In our analysis of light patterns we have gone back as far as 9:00am this morning. Our data shows that the entire period studied has been one of uninterrupted sunlight. It is our considered view that if the government continues to target reductions in public sector spending as a priority, this pattern will continue in the short term (see Table 1). 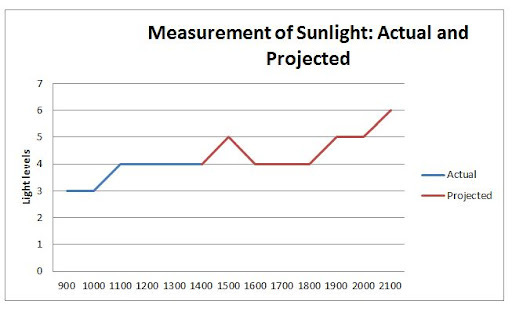 We have also projected long-term what the levels of sunlight will be. 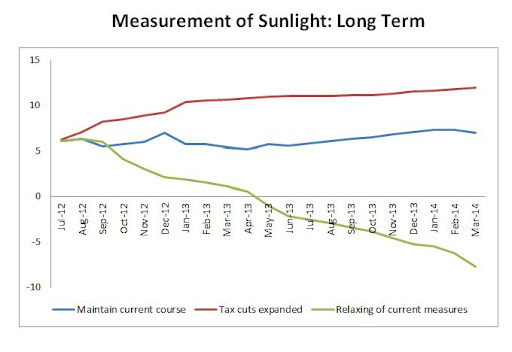 If current policy settings are maintained the Sun should not set until at least 2014. However, if the proposed welfare reforms and cuts to social services are not followed through, the outlook goes from positive to negative. Our modelling also takes into account the potential effect of a reduction in marginal tax rates. Our projections establish that a reduction in the top tax rate would further entrench the Sun’s position and reduce the likelihood of nightfall. Some more conservative forecasts have picked that the Sun will fall some time after 5:00pm today, regardless of the policy settings in place, and that a period of darkness will ensue. However, in our view these outlooks are unnecessarily pessimistic, and they fail to take into account the steady progress made by government to bring spending under control and to tackle public debt. Additionally, we consider a number of the forecasts provided by other organisations to be unreliable, due to flaws with their data or poor study methodologies. In particular, almost all of the astronomical studies we examined about the movement of the planets are open to question. It should be noted that none of these studies have been published in any of the leading economics journals. The lack of any stringent review process involving economists and financial analysts to ensure astronomical studies are based on accepted economic science is troubling. A number of astronomers have also failed to account in their study results for the impact of market forces. These failures point to those studies being biased in favour of observable phenomena, rather than market paradigms that have no basis in reality. We have accordingly disregarded all evidence by astronomers, physicists and other scientists. The effects of darkness have not been exhaustively studied by economists, but there is some evidence to suggest that a sustained period of evening would have a deleterious effect on the New Zealand economy. Some businesses would thrive in the challenging market conditions that a shift to night would bring, including many in the hospitality, entertainment and lighting sectors. However, in general the evening economic picture is a gloomy one, and what evidence we have found suggests that darkness would lead to a sharp drop in productivity and a number of businesses closing their doors. The impact of more than a few hours of night on growth and productivity figures could be severe. In an economic environment that is already challenging for many businesses, the setting of the Sun could lead to a period of prolonged recession. Our forecast is based on the assumption that no sudden and drastic change occurs in Europe. It is dark in Europe at the moment, but any unexpected movement of the Earth, such as a gradual rotation, would increase the risk of the Sun rising in that part of the world. Such an event could plunge New Zealand into an intense darkness. While our outlook is for the bright light to continue uninterrupted over New Zealand until at least 2014 under current policy settings, events in Europe may require a reassessment of our projections. The international economic data is certainly not conclusive that the rising of the Sun over Europe would result in the Sun falling in New Zealand, but to reduce the impact of a European dawn the government should take urgent steps to encourage the development of additional suns. Reducing unnecessary compliance costs for businesses would go a long way towards lowering the market barriers for new sun entrants. The creation of economic conditions that incentivised market players would increase competition between providers of sunlight and lead to an expansion in the supply of sunlight to consumers. For example, the laws of physics make it prohibitively expensive for businesses to secure suns from other systems and import them to New Zealand. These laws should be relaxed, if not repealed, immediately. If these steps were taken domestic suppliers would be able to provide adequate sunlight for most market participants, even if the Sun did rise in Europe. With luck and some sensible planning it should be possible to reduce the likelihood of a sudden nightfall. If the government takes the steps recommended in this report then New Zealand can be assured of a brighter future. 10 June, 2012 in Treasury.